This harmonious bouquet of lilies and roses creates a dazzling display of color and is a memorable gift for any special occasion. The bold blooms in vibrant shades of red and pink fill any space with their soft, lovely fragrances. 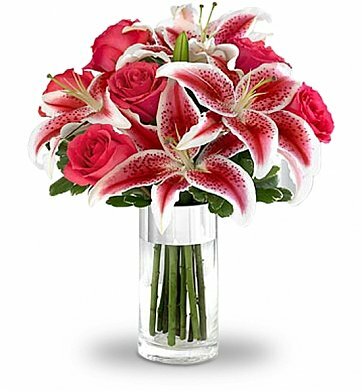 Hot pink roses delicately accent the remarkable beauty of stargazer lilies, all perfectly arranged in a clear glass vase that showcases the flower's green stems. Simple Elegance Bouquet is a hand delivered gift. These gifts are delivered by one of our local design centers located throughout the United States and Canada. Same day delivery is available for most gifts when ordered before the cutoff time. The cutoff time for Simple Elegance Bouquet is 2 PM in the recipient's time zone. Wonderful birthday surprise with a Happy Birthday balloon. Everything looked great and the recipient was more than pleased. The person that received the flowers was delighted. She said the arrangement and colors were beautiful. the flowers were just as the picture, so I'm happy i chose you guys. Keep it like that! !